This otaku classic returns 10-years later on Blu-ray, courtesy of Funimation Entertainment, and has its episodes gathered together in the 2009 re-broadcast order, which is to say, in chronological order, unlike the controversial original 2006 broadcast which had the episodes all out of whack, to use a technical term. The Melancholy of Haruhi Suzumiya is an odd duck of a series. It takes many of the usual tropes we are all familiar with in anime – high school, comedy, tsundere, sci-fi – and turns them into a strange and quirky story. In this series, the protagonist is not as you would expect given the title, it is the male Kyon, who also narrates. He is cynical, he’s wry, and he gets sucked into the eccentricities of his new classmate, the female Haruhi Suzumiya, who gives the series its title. She drags Kyon into her mission to start a club in search of aliens, espers, and other strange phenomena. They manage to wrangle three other members. First the icy cold bookworm Nagato Yuki, then the very shy moe Asahina Mikuru, and finally the very outgoing transfer student Koizumi Itsuki. Kyon finds out that all of the members in the club are all exactly the kind of people that Haruhi wanted to find, because she wanted to find exactly those sorts of people. In other words, she has an ability, unbeknownst to her, to change the reality of the world she lives in, and they have all been sent there to observe her and send back information to their various organizations. It has fallen to Kyon, the only average teenage kid in the group, to ensure that Haruhi has a normal life experience and her powers don’t destroy the world. There is a very sarcastic sense of comedy in Haruhi more than usual for a high school-set series. It lulls you in thinking you’re in for the usual high school romance with a disinterested high school guy who crosses paths with a tsundere girl whose initial dislike turns to love, all with some sight gags and physical comedy thrown in. Wrong. The twist of sci-fi, strange reality shifting and this girl whose hidden power and listlessness can have the world teetering on destruction makes more interesting. Kyon actually grows and finds out a lot about himself and Haruhi as the series goes on, through both seasons. And the animation is about as good as it gets for the genre too. It’s quite moe, but also there is a lot of detail and genre mixing, and the styles change appropriately. This release comes with what Funimation lists as a “Native HD” AVC 1080p encodement of the series framed at 1.78:1. I have to say that it doesn’t exactly look like native HD; either that or something is up with the master that Funimation has been given, because there are definite motion artifacts and aliasing around the edges. This is usual a sign of an image that has been upscaled, but apart from that, the colors do look like an HD image and detail is generally crisp, so it’s a mixed bag. 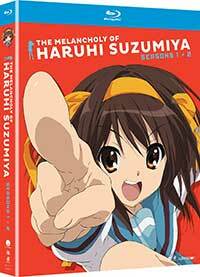 The Melancholy of Haruhi Suzumiya comes with the original Japanese-language track in Dolby TrueHD 2.0 stereo and the English dub from Funimation in Dolby TrueHD 5.1. The sound is good on all counts and if you know me and how critical I can be on Funimation releases when it comes to the audio tracks and their problems, take that as a BIG plus. There are no issues with lip sync, the mastering levels and dynamic range for both the 2.0 and 5.1 are good, if not great, and clarity and balance are excellent. We also have in this series voice casts where the English dub actually isn’t steps below the quality of the Japanese performance. Crispin Freeman in particular does a really good job with the voice over narration portion, almost as good as Sugita Tomokazu. I’m not sure why exactly, the extras have been split across a Blu-ray and a DVD, but they are. I’m not sure if this is in error, because this is listed as a Blu-ray set, not a Combo pack. It’s a very good set of Making Ofs and promos and trailers. 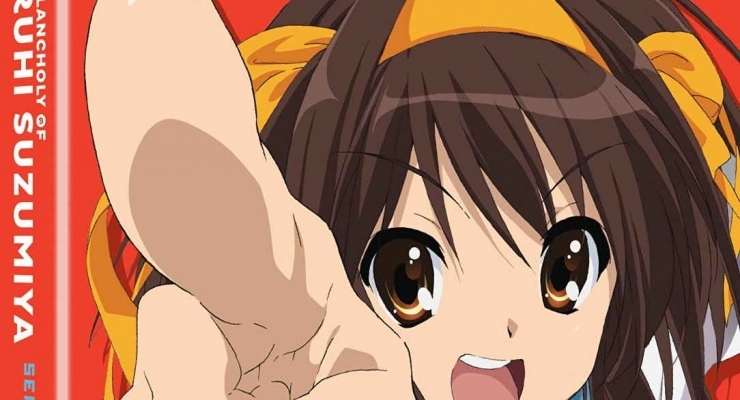 The Melancholy of Haruhi Suzumiya stands up after up to 10-years. Revisiting this series is a pleasure. It’s hip writing and comedy, almost philosophical look at the doldrums of teen angst, and animation style make it a fun watch. It's not melancholy at all and this mix of sci-fi, comedy and the paranormal holds up well in comparison to the many imitators that have come in the intervening years.